Mest centralt beliggende Residence i Prag. Denne bolig er beliggende i det mest eksklusive område i Prag og er mindre end et minuts gang fra Old Town Square og få minutters gang til Karlsbroen. Inden for kun få gader væk er Parizska Street (Rodeo Drive of Prague) denne bolig ikke kunne være på en bedre placering. Alt om denne ejerlejlighed er top of the line, første klasse og immaculately ren. Tre meget store soveværelser med ny kvalitet sengetøj og håndklæder. Senge og madrasser er nye, ligesom alle møbler, gulvbelægninger og tilbehør. Designer Køkken er helt nyt, perfekt til privat spisning eller underholdende. Mit pris er firma og jeg tilbyder ikke rabat. Hotellet blev totalrenoveret i 2016 og har nye designmøbler, nyt køkken og nye badeværelser. Nyt tv er i både King soveværelser og stuen, med højhastigheds internet og WIFI i hele lejligheden. Ekstremt komfortable nye high-end madrasser og 300 trådtællingsark og sengetøj. This was an unbelievable town home! Spacious, totally remodeled, perfect location, and a place for everyone to relax and enjoy the wonders of Prague. We walked everywhere...all attractions are close by, great restaurants, and beautiful Old town square. And the weather for November was perfect! Would definitely stay again, and recommend highly. This place was amazing. So convenient, clean & beautiful! Property manger Martin is so helpful & the driver Michael was great!! If you planning on going to Prague, this is definitely the place to stay. My entire group can’t stop talking about this place. It is absolutely perfect!!! 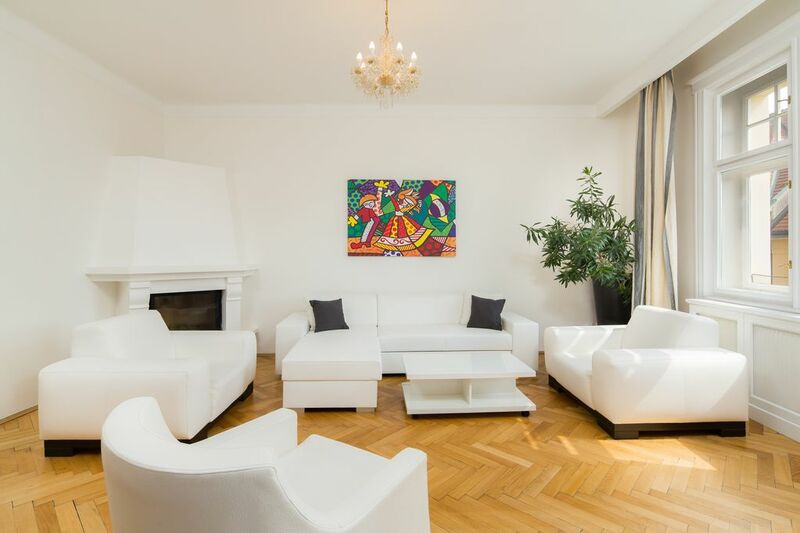 Wonderful large, perfectly located apartment. We had the pleasure of staying in this beautiful apartment in early October. The apartment is large with 3 bedrooms and 2 bathrooms and will easily fit a family of 8. It has all the comforts of home lacking nothing for a great stay. Allen provides great customer service and communication. His in country assistant Martin is also very helpful. Together they made our stay stress free especially meeting us at the airport with a sign and helping us with our luggage. They also assisted with transport back to the airport. There are many great restaurants near the apartment with old town square only 3 minutes away. When we return to the beautiful city of Prague we will definitely be contacting Allen for accommodations. We had a terrific stay at this beautiful apartment and loved the location. Martin picked us up at the airport and oriented us to the city. The apartment was just two blocks off of the old town square - on a quiet street. Every aspect was perfect--comfortable beds, very clean---we were extremely pleased! Very spacious, well equipped place in a great location. We walked almost everywhere. Very close to the Old Town Square with great shopping and restaurants. The on-site manager, Martin, was very nice and helpful. Very responsive.